Geometry Wars: Galaxies os set up with a very logical, understandable layout. The transmission of the demo is in "Connectivity" (not in the "Options" menu like some other games; *cough* *cough* - you know who you are) and Connectivity makes a LOT more sense to look in to newer gamers. After sending the demo from the "Connectivity" option, multiplayer is - obviously - in its "Multi Player" menu. The opening sequence is long and drawn out, and it cannot be skipped. In fact, after the game is downloaded, the guest experiences the same, unskippable opening credit sequence. The download itself takes between 50 seconds and a minute. It would have been nice to navigate the menu via touch screen when the menu is on the lower screen, but the programmers kept the same control scheme for the menu regardless of where it is located - buttons. The menu options are a little small, but readable nonetheless. Because the touch screen is not used for menu manipulation, most normally reviewed aspects (like buffer space) are irrelevant. Geometry Wars: Galaxies has three selectable options that can significantly change the control scheme, and that's a good thing. One option is right-handed vs left-handed controls. That might seem like an obvious thing to have in a touch-screen game, but not enough games take that into consideration (to play fair, not all touch screen games would benefit from it, but a lot more of the games on the market could). The second option is whether the touch screen controls the ship's movement or it's firing. The third option is whether the spatial grid with the enemies is on the upper screen or the lower screen. When the spatial grid is on the upper screen, a copy of the ship is always displayed on the lower screen and you're always touching the lower screen above, below, to the left, or to the right of the lower screen ship, and that's how the ship on the upper screen knows where to move/fire. When the spatial grid is on the lower screen, you simply touch where you want the ship to move/fire. Overall, the game is EXTREMELY intuitive. Geometyr Wars: Galaxies is fun. It's as simple as that. It hearkens back to Meteos in it's fun and replayability (even though Meteos is an action puzzler and not an action shooter). Anyone who loves Meteos will love Geometry Wars: Galaxies. There's a lot to do, three unique multiplayer modes (Versus is a blast! - no pun intended), and you can actually customize it which, like I said above, is pretty are for downloadable content. There are as many different strategies as you can think up and all the replay motivation you need can be summed up into six words: "Nice score. Can you beat it?" While I may come off sounding like a commercial, it's nice to see Single-Card Download contect at this level of competency come from a third party publisher (every other game reviewed to date that's scored a 90 or above has been published by Nintendo). I'm excitedly looking forward to a sequel and I just hope that the next time I review a Geometry Wars game, I don't get caught up playing it so long it takes twice as long to complete a review as it's supposed to! Shorten up the opening credits (or make them skipable). Offer a mode with two-screen maps. Introduce an option to set off a bomb via voice command ("Bomb!" or "Boom!") to remove the need to press that particular button. Allow on-line (Wi-Fi) battling (not Single-Card Download). Allow scrolling for the online leaderboards (not Single-Card Download). 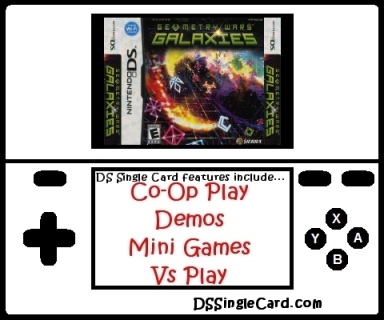 Click here to return to the DSSingleCard.com Geometry Wars: Galaxies profile.